In five days with TapRooT®, you can learn how to conduct an investigation and develop effective Corrective Actions. A TapRooT® course is a career booster and can be a professional game changer for you. From beginners to experts, TapRooT® is designed for learners at all levels. You will learn to find and fix the root causes of incidents, accidents, quality problems, near-misses, operational errors, hospital sentinel events, and many other types of problems. Techniques include: SnapCharT®, Root Cause Tree® & Corrective Action Helper® plus additional advanced topics such as CHAP, Human Engineering, Interviewing, Safeguard Analysis, and Proactive Improvement. Upon course completion, attendees will receive a certificate and a 90-day subscription to TapRooT® VI, the online software service. Most importantly, you will have the advantage of professional training in your expertise and on your resume! We’ll gather and kick off the 5-Day TapRooT® Advanced Root Cause Analysis Training at the Courtyard by Marriott Hamburg Airport on June 11. You may want to make plans to explore your host city while you’re there. See our travel tips below. Register here for the course. Hamburg—Germany’s second-largest city and seaport—offers you lots to explore. Walk along the harbor, see the sights, and plot your Hamburg game plan. Visit the port. See Hamburg and feel its maritime vibes on a boat tour. View the fish market, pass contemporary seaside architecture and the Elbe beach, touring across the port and back. Honored as a Historic Landmark of Civil Engineering in Germany, the Old Elbe Tunnel was the first river tunnel on the European continent. Access the entry point from the harbor, walking to Steinwerder and back to St. Pauli in a few minutes. 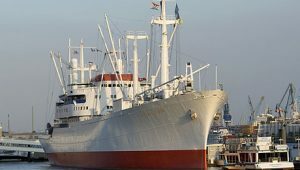 Marvel at the Museum Ships—such as Rickmer Rickmers and Cap San Diego—Hamburg’s heralded historical ships, moored by the harbor. 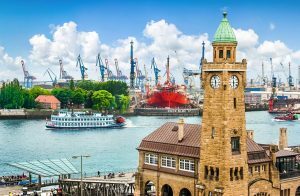 If you’re a fan of model ships, U-boats and military history, visit International Maritimes Museum Hamburg, with the world’s largest private collection of maritime treasures, in historic Speicherstadt. Appreciate the art and architecture of the oldest parish church in Hamburg, St. Peter’s Church, just a few blocks from Town Hall. Bronze lion-head door handles grace the west portal and date from 1342. A gothic mural that dates from 1460 is in the north portion of the church. The bell tower is up 544 steps and offers a grand view over Rathausmarkt, the Town Hall market, and Alster Lake. Impressive sandstone Town Hall, also called Rathaus or City Hall, houses the senate and parliament among its 647 rooms. Note the staircase made of Sardinian marble, a commentary on the course of human life. Check out Miniatur Wunderland, the largest model railway in the world. Close to the miniature wonderland, the canal of Nikolaifleet is one of the oldest spots in Hamburg, where you can see well-preserved Old Hamburg townhouses. St. Pauli is a unique quarter in Hamburg, a great place to walk around and absorb the street art, get a drink, and shop. Fun fact: Hamburg has more bridges than Venice. Hop on a double-decker bus for a fun city tour. 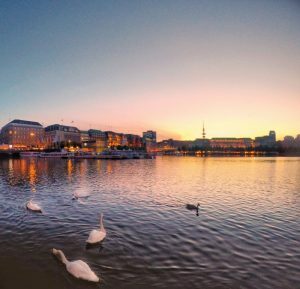 Take in the Landungsbrücken, the breathtaking harbor, historical Speicherstadt, modern HafenCity, famous Reeperbahn, the ‘Michel,” the Alster, Town Hall, museums, and villas. Want more action? Take a beach walk on the Elbstrand, bike by Alster Lake, and kayak Hamburg’s canals. Relax in the Rissen district, by the Elbe River on the Wittenberg shore. Nearby, explore the Wittenberg lighthouse. Relish the views from the bistro and the collections in noted art museum, Hamburger Kunsthalle. Nosh at Barefood Deli. This bright, cozy atmosphere was introduced by a famous German actor and is family-owned. Homemade beer and wine, Sunday brunch, DJs in the evening—food and fun for everyone. Dine with a view of Hamburg harbor at Fischereihafen, where fish dishes rule the day. Another great fish eatery is Schabi’s Fischimbiss, where you can pick your own fish, eat inside or out, and enjoy the experience. Insider tip: If you’re more interested in exploring than sitting down to dine, pop into a Hamburg grocery store for cheap-and-go items. Groceries often give out generous samples, so keep your eyes open! You can see it from the Elbe bridges: Entenwerder 1. What a view from this pontoon eatery! Public Coffee Roasters is next door, so the cappuccino, espresso and coffee are amazing. In a former pharmacy, the Brooklyn Burger Bar’s offerings are fresh and homemade. Taste chocolate at Chocoversum. Learn about the process and create your own chocolate bar. Enjoy Luicella’s Ice Cream in the St. Georg or St. Pauli locations. Taste Scandinavia at Karlsons, where the Norwegian apple pancake is but one of the offerings you’ll long remember. Klimperkiste is a bar and an eatery, so you don’t have to choose. Good for all night or a nightcap. 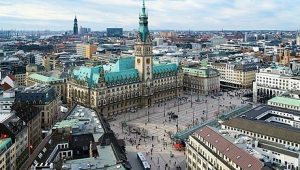 Discover more to explore from our Hamburg Pinterest board and begin planning your TapRooT® trip to Germany today. Download the handy, free Hamburg app here.